With Palmeiras’ 100th birthday at D-55, no effort should be spared in trying to get our new home ready in time. 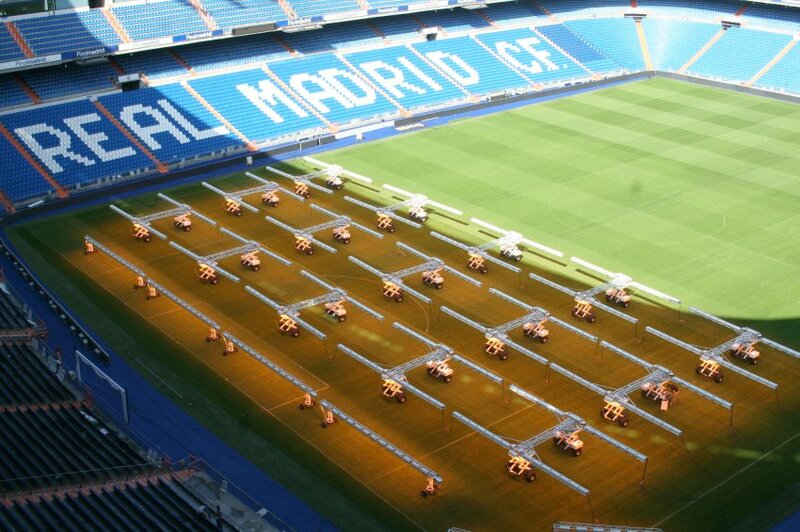 An important component was stuck in customs for quite some time, but has finally arrived at the arena in eight, large containers: the “Stadium Grow Lighting” system consisting of six MU160 MU360 units and two MU50 units (below, you see the technology in operation at the Santiago Bernabéu stadium), designed to provide superior conditions for natural grass to grow strong. 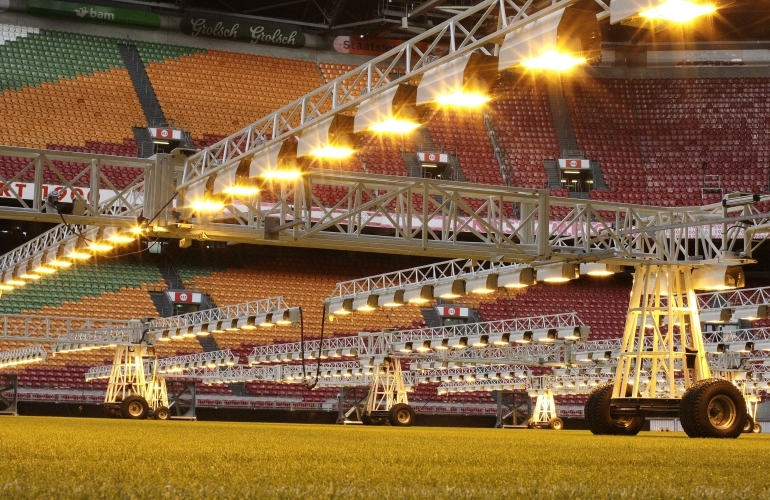 Dutch company SGL is the market leader in this segment, contributing to perfect pitches in more than 140 stadiums all over the world. This particular piece of equipment was imported by World Sports, contracted by WTorre to handle the pitch. Planting of the grass is expected to initiate early next week and the first trim should happen some 30-40 days later. Thus, we’re talking playing conditions maybe second, more likely third week of August. And that’s a best case scenario. The Allianz Parque itself is more than 90% complete. Retractable chairs are being fixed to the metallic rails, some 20.000 seats already in place. At the very upper part of the stands, partially overlapping large plates allow for air to circulate while at the same time confining noise, promising to turn the stadium into an intimidating place for visiting teams. The two 103 square meter LCD screens are up. There are wifi antennas everywhere. Many of the security cameras are also up and ready, and VIP boxes have received their windows facing the pitch. WTorre is also involved in the execution of several changes to the area surrounding the stadium, allowing for greater mobility both for visitors and residents. Additional improvement have a longer timescale: the Brazilian development bank BNDES recently approved some US$ 2 billion for the construction of a new Metro line in São Paulo, a line that includes a stop very close to the Allianz Parque. Unless there are delays, the line will be ready by 2020. There’s no telling if the Allianz Parque will stand ready in late August. WTorre has promised it will, again and again. Not only Palmeiras are eager to see the stadium ready; other sporting events are lining up, the Italian Supercup being one of them. The competition consists of a single game between the Italian national champion (Juventus) and the Italian Cup champion (Napoli). On six previous occasions the Supercup final has taken place outside of Italy: 1993 in Washington DC, 2002 in Tripoli, 2003 in New Jersey, and 2009, 2010 and 2011 in Beijing. And 2014 in São Paulo – at Allianz Parque – if this group of investors are successful in promoting their idea. 23 December. Save the date. At least, out of precaution.